“Carving time out from one’s regular schedule and work engagements to embark on such a mammoth work of translation has been difficult.” – Bibek Debroy on spending only 6 years translating the longest of all world epics, The Mahabharata, unabridged, 73,787 Sanskrit couplets into 2.5 million English words, in 10 volumes, the first of which, in my hands, is just shy of 500 pages. It’s a remarkable achievement not to die before finishing. Not only that it reads well. Don’t cross the mother goddess. She has many sides. Meet Durga. This is a draft and has been moved to C21CH. In Rings of Saturn, Sebald’s description of Rembrandt’s The Anatomy Lesson leads us to but breaks off before reaching the heart of the allegory. Sebald draws our attention to features of the painting a casual observer might miss. Points which demonstrate the picture is not merely a depiction of an event dutifully recorded for his commissioners but a critique of that event, under their noses of, or perhaps in their face, since they must have had the time and inside knowledge to see the purposeful flaws and other cues that provide the clues to the allegory. Sebald points out that the dissected hand is larger than the other hand, that it is should be the left hand but is in fact a right hand drawn in the wrong place. It looks like it is naively copied from an anatomy text book. 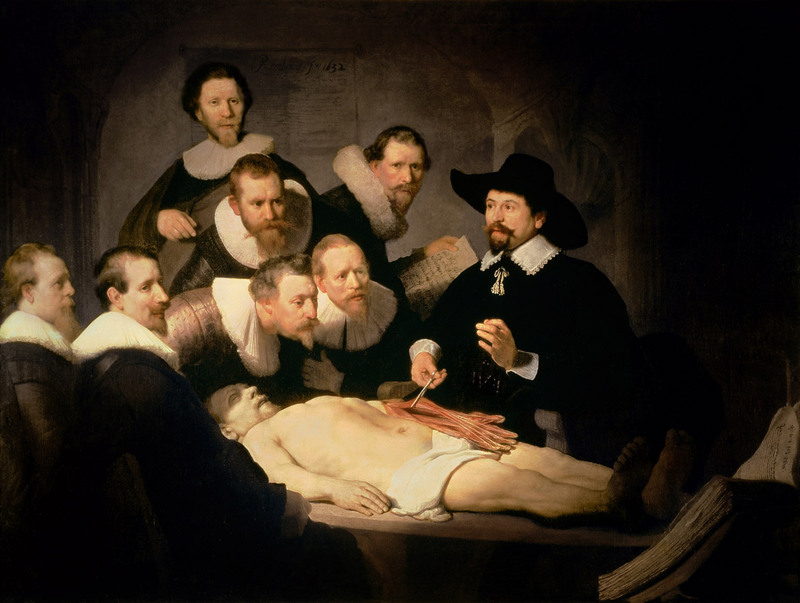 This is no mistake, Rembrandt was a master of photo realism, and this is confirmed when we note that nobody in the picture is looking at the dissected hand. Strange given that the point of dissection is to see with one’s own eyes, and to judge, to form conclusions, based on observation of the real world. Instead, the teacher looks at the students, two gaze at the painter or out of the painting at the viewer, and the rest look over the corpse to the open anatomy text book. Art and literature of this period typically deals with elaborate conceits, based around metaphors and frequently playing on the contrast of opposites and paradoxes – life and death, growth and decay, love and loss, sacred and profane, and so on. Contrary to the ideal of science, the text is transposed onto the object of study. The arm is not an arm, but an anatomical drawing, and the students continue to see the abstraction of the book, not the body before them, which they ‘overlook’ as the source of truth and reality. Sebald also points out that contrary to the Enlightenment ideal of having moved beyond the cruel and superstitious past that it is no coincidence that it is the hand which is dissected and that the dead man is able to used by these scientists because he was a criminal, and so able to be denied a Christian burial, in particular a thief. The thief’s punishment is traditionally to have a hand cut off, and here it is flayed in the interests of science. The punishment is to be reduced to an object of science. The Enlightenment has more recently been much criticised along these lines, that despite it’s lofty ideals of objectivity, Enlightenment ideals lead to much injustice and cruelty. In particular that detached, rational objectivity is a myth that, as often as not, even if it is pursued in good faith and with good intentions, serves those in power, and that it is deployed to avoid criticism and to deny subjectivity and sidestep ethics. We see this critique already in Rembrandt, as the Enlightenment began. Notably it is rich patrons who have the privilege of being Enlightened at the spectacle of the theives body opened up to their gaze and knowledge. There is a marked contrast between the rich, enlightened possessors of knowledge and the man reduced to theft, robbed of life, his body desecrated for the edification of these masters. With this in mind, the gaze of the two members looking out at the viewer is disturbing. One looks directly at us while the other is in the middle of turning to look at us, as if interrupted – it’s as if we’ve stumbled on a group of cannibals preparing for a feast and having caught sight of us they are sizing us up, looking through our skin at our sinews, considering whether we shall be next on the table. It’s a moral warning, just as depictions of hell are, just as a public execution is, just as a hanged man at a crossroads is – theive not, the picture says, the gaze of the students says, or your fate too may be dissection. Sebald notes that the people in the picture are ignorant of that humanity that Rembrandt sees and depicts in the shadow of the corpses mouth and eyes. What Sebald doesn’t go on to note, which seems to be the most telling part of this allegory, is that the shadow falling over the eyes of the deceased is cast by one of the students. Again, this seems no mistake. The picture is all about the gaze, and the shadow falls specifically and clearly just over the dead mans’ eyes. In this iconic picture of Enlightenment, the corpse is robbed of sight, the light is taken from his eyes, and not merely this. The light of the Enlightenment is taken from his eyes, precisely because the student, is leaning over him to read the book, to see and understand, to be enlightened. All human dignity has been taken from the corpse, all life, all subjectivity, as he has been reduced absolutely to an object of scientific study, an object of knowledge. The criminal victim cannot see, only be seen and not only be seen but be opened up for the most intrusive and complete scrutiny. It’s a brutal violence, as the denial of Christian burial denies respite for the soul, the objectification of science denies all humanity – a brutal and savage annihilation. Enlightenment has blinded them to the violence right before their eyes. Sebald remarks that Thomas Browne’s skull was at one time dug up and displayed in a bell jar and it was not until a campaign of reclamation was undertaken by the church it was taken from that it was returned to the ground. Following Sebald’s segues and digressions we find ourselves deep in consideration of the use or misuse of dead bodies. He have attended The Anatomy Lesson because Sebald suspects Thomas Browne, author of Urne Burial may have been there too. Through this memento mori in a book we confront the ephemerality of all possessions, titles, name and works, fame and fortune. Sebald says of Browne, “…he writes that to be gnaw’d out of our graves is a tragical abomination. But, he adds, who is to know the fate of his bones, or how often he is to be buried?” As for everyone, Sebald’s thoughts lead on from one to another by association, and he dips in and out of things he has learned and read and his personal experiences, and so a reader of Rings of Saturn dips into the text and out into their own thoughts, on other paths to Sebald along divergent connotations derived from our different reading and experiences, so I think of all the body parts of colonised people in museums and collections around the world, trophies for the edification and enlightenment of philanthropic benefactors and the public. There are movements to repatriate them. I imagine a middle manager in the British museum hovering over bones laid out upon a table, being handed a picture of The Anatomy Lesson, not sure why, but lingering on it for longer than a moment, looking into the shadows at the closed eyes of the corpse.